As a co-founder and president of Engage, Jake sets big picture strategy and serves as the public face of the company. Jake has a truly incredible story that has been well chronicled and featured in just about every outlet from ESPN to CNN to the New York Times to the Wall Street Journal to the Washington Post. At 8 months old, he was diagnosed with a rare form of eye cancer, retinoblastoma. The disease claimed his left eye before the tender age of one and in November 2009 Jake lost his right eye after battling the cancer for 12 years. Jake has not let blindness stop from achieving any of his goals. 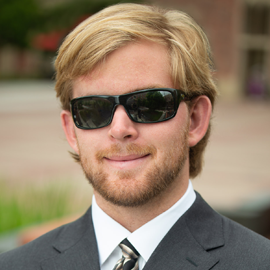 He attends the University of Southern California where he is a senior majoring in business. He also plays on the school’s football team as a long snapper, and during USC’s game against Western Michigan on September 2nd , 2017, Jake made history as the first completely blind player to ever play in a Division I football game. Jake has used his fame to inspire others and travels around the country as a motivational speaker. He is also a member of the President’s Council on Sports Fitness and Nutrition, has written two books, started his own charity, and golfs in the mid 70s. Outside of Engage and football, Jake loves golfing, playing the guitar, and hanging out with friends.